Pakistan comfortably won the fifth ODI against Sri Lanka by nine wickets, completing the whitewash in Sharjah on Monday. Chasing the 104-run target set by Sri Lanka, Pakistan only lost Fakhar Zaman who was caught behind on 48. Imam-ul-Haq, who made a century on debut in the third ODI of the series, completed the chase with a four, contributing 45 runs in total for Pakistan's cause. 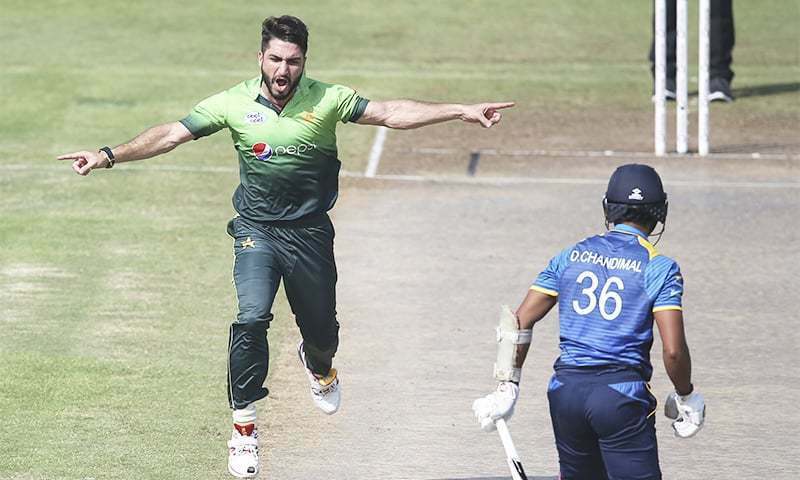 Earlier, Sri Lanka lost their first five wickets for 20 runs thanks to a whirlwind spell of pace bowling by newcomer Usman Khan Shinwari, which set the stage for their eventual collapse for 103 all out in the 27th over. Looking to avoid a 5-0 whitewash in the series, Sri Lanka had chosen to bat after winning the toss for their fifth One Day International against Pakistan in Sharjah. However, Shinwari, it seems, had other plans for their side. The pacer, who launched his ODI career in only the previous match of the ongoing series, snatched five wickets within his first four overs, leaving the team teetering on the edge of an embarrassing defeat. Shinwari sent back Samarawickrama and Chandimal in the first over of the match, mounting the pressure on his opponents. Following through on his success, he took down Tharanga and Dickwella in his next over, and sent Siriwardana back to the pavilion in his fourth (the inning's seventh). Hasan Ali had Lahiru Thirimanne, the first of only four Sri Lankan batsman to reach double figures, caught behind the stumps in the fifteenth over to tie down the opponents at 49 for the loss of six. Prasanna was run out in the 17th over, as Sri Lanka crumbled to 63 for the loss of seven. Thisara Perera, who seemed threatening at one point, was caught at long-off off a Shadab Khan delivery. Three balls later, Shadab dispatched Vandersay back to the pavilion for being leg before wicket, and Sri Lanka had sunk to 85 for the loss of nine. They managed 18 more runs before Hasan Ali bowled out Chameera in the 27th over, limiting the target to a paltry 104. Earlier in the day, Upul Tharanga had won the toss and elected to bat first for the third ODI, as Sri Lanka went into the fifth match against the green shirts looking to avoid a second consecutive series whitewash against an Asian opponent. They were beaten 5-0 by India in their last series. Pakistan, in search of their ninth straight win, made just one change, opting to bring in Faheem Ashraf in place of Junaid Khan. It gave Sarfraz Ahmed a number of all-round options, with Mohammad Hafeez, Shoaib Malik, Imad Wasim and Faheem all capable of performances with bat and ball. Sri Lanka have made three changes to their side, with Vishwa Fernando, Dushmantha Chameera and Jeffrey Vandersay replacing Akila Dananjaya, Lahiru Gamage and Suranga Lakmal. “I will be disappointed if we didn’t make it 5-0,” Pakistan's Head Coach Mickey Arthur said on Sunday, making the intentions of the Pakistan side very clear. Pakistan came back in the ODI series, winning the first four matches of the series after being whitewashed by the Lankan tigers in their first Test series since Misbah and Younis retired. The two sides will play a T20 series next, with the last match of the series being played in Lahore. The first match of the series will be played on Thursday. Pakistan comfortably won the fifth ODI against Sri Lanka by nine wickets, completing the whitewash in Sharjah on Monday. Chasing the 104-run target set by Sri Lanka, Pakistan only lost Fakhar Zaman who was caught behind on 48. Imam-ul-Haq, who made a century on debut in the third ODI of the series, completed the chase with a four, contributing 45 runs in total for Pakistan's cause.